On the Saturday night back at Newtonmore Hostel, my friend Ali and I checked out the forecast for the next day. Sadly it was even worse than the constant heavy rain formerly predicted. 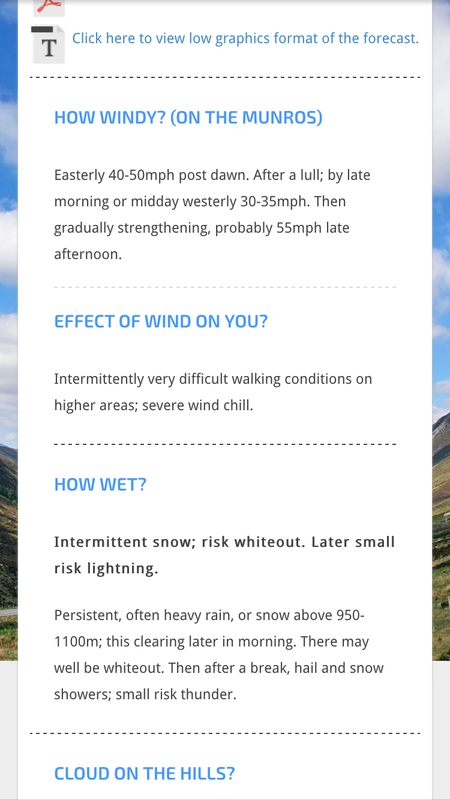 Winds of up to 55mph, severe wind chill, persistent snow, possibly thunder and lightening. After last weekend’s failed trip, we had managed to order the new part for Bertha (the Bongo) and book her in to a friend’s garage near Forres to get fixed. On Friday night we dropped her off up in Forres and headed down the road towards Newtonmore. We had been invited to Glen Etive by the 45 Degree Mountaineering Club for the weekend, but due to the journey, we planned to break it up by stopping in Newtonmore for the night (at the excellent Newtonmore Hostel) and going to Glen Etive the following night. The following morning turned out quite a stunner – I was very surprised because it was way better than what was forecast. Our plan was to walk up the two Glen Spean Munros, Beinn a’Chaorainn and Beinn Teallach, before heading to Glen Etive.